Delia Despina Dumitrica - Uniate /vs./ Orthodox: What Lays behind the Conflict? Uniate /vs./ Orthodox: What Lays behind the Conflict? Abstract: The current paper investigates the Romanian Uniate/ Orthodox conflict from the perspective of peace and conflict studies, making use of an interpretation of Johan Galtung's conflict theory and his proposed analysis tools.2 The aims are to contribute to a more comprehensive and multilateral understanding of this conflict in a wider context than the ideological one and hopefully to suggest some of the means of attenuating the conflict. The first part of the paper reviews the emergence and development of the Uniate/ Orthodox conflict, proposing four different phases with particular characteristics and arguing that the conflict was shaped and re-shaped throughout these stages from an ideological to an economic level. Ariadna's thred is the quest for power (understood in all its dimensions). The second part of the paper will address the methodological issues, defining the main concepts used and putting forward an analysis of the conflict in view of the proposed methodology. Finally, the conclusion will attempt to peer into possible futures, mapping alternatives for conflict transformation laying ahead. - the Orthodox Church and the Romanian state were forced into accepting and accommodating the Uniate Church. In the present phase, the conflict is no longer on ideological level, but on the economic level, namely resources. This opens opportunities for a positive conflict transformation - or not - the final decision resting upon the actors. This phase may be seen as the non-violent emergence, delimitation and definition of the initial conflict, which opposed the Romanian Orthodox Church, on one side, to the Catholic Church and the Habsburg Empire on the other. Not surprisingly, the Romanian Orthodox Church did not happily accept this act. In fact, it never ceased to regard this conversion as a "betrayal", accusing that its members were lured by the Catholics, in a political stratagem, and the Uniates were rather perceived as the "victim" and were expected to rejoin the Orthodox rite as soon as this would be possible. 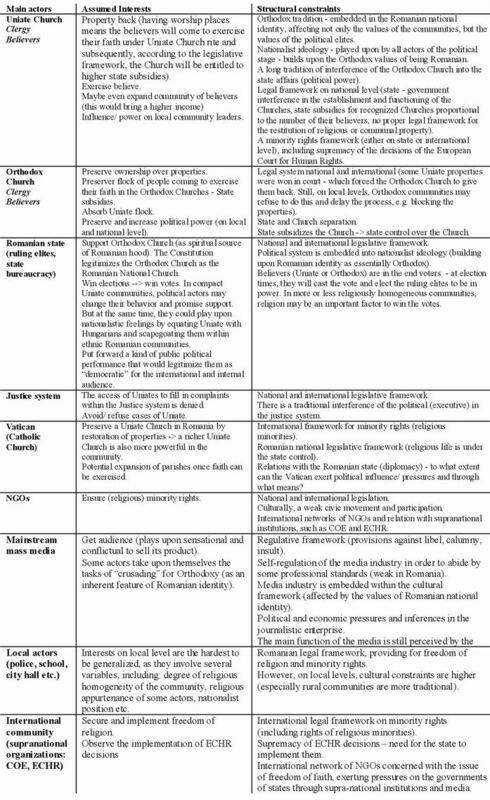 These tight links between Romanian nation-hood creation and the Uniate Church legitimized the latter within Romanian nationalist ideology7 and subsequently forced its acceptance as a separate entity by the Orthodox Church. Even more, as the ruling dynasty of the Hohenzollern was Catholic by birth (changing religion only due to political reasons), by 1926 the Uniate leaders were granted a position in the Romanian parliament, thus challenging the dominant traditional role of the Orthodox bishops over the ruling elite.8 The increasing Catholic political influence came to an end under Antonescu's government, when Orthodoxy became the means of mass manipulation (Orthodox values were used to mask the extreme nationalist and chauvinistic policy of the Iron Guard) and subsequently equated to being a "true Romanian". could have raised doubts on the centrality of Orthodoxy within the definition of the Romanian identity. By losing its centrality, the Orthodox Church would also lose its political influence and monopoly over religion (with everything deriving from lose of the status of `national church'). Thus the conflict was in itself altered: the fight was no longer to bring back the lost flock, but rather to keep the flocks apart in order to prevent any claim over power and resources. 1.3. From 1945 to 1989: A Latent Phase? With the Concordat abolished, the absorption process of the Uniates started in October 1948, when thirty-eight Uniate priests made a formal request to the Patriarch for rejoining the Orthodox Church. These priests were carefully selected by the government and, in spite of the protests of the Apostolic Nuncio and of some other Uniate bishops, the reunification proceeded. The assembly's decision was confirmed by the Government in December of that year. The reunification process was not as easy as it might have seemed and over six hundred churchmen were imprisoned.13 However, once accomplished some of the Uniate properties were nationalised and some were transferred to the Orthodox Church. On their part, the Uniate clergy and believers "conformed on the tacit understanding that, if given a chance, they would revert to Rome. "14 and functioned unofficially, holding underground meetings, secretly appointing bishops and preserving its believers. violent and aggravated the attitudes of the actor whose mere existence was denied. 1.4. From 1989 onwards: Control over resources. With the demise of communism, the Uniate Church self-restored on the very last day of 1989 (recognized by the government in April 1990) and reclaimed its nationalized properties, as well as those transferred in 1948 to the Orthodox Church. At this point in time, religious freedom has been restored and secured in the legal framework; but at the same time, the Orthodox Church preserved its role as the "National Church of Romania" and openly reclaimed its centrality in the definition of Romanian identity. It was hard to deny the Uniate their right to existence, but at the same time it was easy to influence the public agenda on behalf of the Orthodox Church. Greek-Catholics. The attacks of the Orthodox Church were on several occasions supported by the government to stir up nationalistic feelings against Hungarians in Transylvania (by suggesting that Romanians can only be Orthodox and Hungarians - Catholics, hence Uniate are serving Hungarian interests). Several attempts to reconcile the two churches' claims over the same resources failed. A 1990 mixed joint commission set up by a governmental decree to investigate the disputed cases did not meet until 1998 and failed after five meetings in 1999. Because of this decree, courts may refuse to consider lawsuits on the claiming of property. A 1993 document signed between Orthodox and Uniate Churches regarding properties was rejected by the Romanian Greek Catholics. A 1995 meeting between the Orthodox Patriarch and the Uniates was doomed to failure because of the unfair discussion set up by the Patriarch.16 In 1997, a proposal by a Christian Democrat senator on the restoration of Uniate properties in places where there still exist important Uniate communities was boycotted by the Orthodox community and did not materialize. A 1998 meeting between the two churches to reach a compromise failed once again.17 The 1999 visit of the Pope to Romania was a widely covered event, however with no direct consequences on the Uniate _ Orthodox conflict, except at the declarative level. In 2001, two Uniate parishes have sued the Romanian state to the European Court of Human Rights (ECHR). Building upon the conflict theory developed by Johan Galtung, one of the founders of modern peace studies, the current analysis seeks to apply an interpretation of the theoretical framework to a concrete situation. As with any analysis of the kind, the limitations reside in the human inability to take into account all aspects of the conflict, due mainly to its complexity. How is conflict defined in this paper? The protean nature of the concept infringes upon the development of a widely accepted definition, though some common elements enable understanding and mutual completition between the various schools of thought. On the same line with Galtung18, this paper considers conflict as a clash between incompatible, overlapping goals, constructed in a triadic manner within a temporal dimension and summing up the attitudes/ assumptions, the behaviors, and the contradictions involved. (Figure 1) The three corners of the conflict triangle are in correlation, reinforcing and completing each other. Though conflicts may arise within one individual or between two or more individuals, the present paper will consider conflict on the collective level - conflict between communities. A community is here defined as a group of people sharing some common collective values, rules and purposes, as well as a sense of belonging to that particular group. Communities might behave/ act homogeneously without this implying that they are indeed perfectly homogeneous. But at the same time, communities might be split and act heterogeneously, without this implying that there is no longer a community. Analysis should therefore pay particular attention to communities as a whole and at the same time as potentially factional. Conflict on this level automatically involves more than two actors, because local communities are integrated within a broader society and interconnected through various channels.21 Local communities might however share in common certain similarities/ features, like religion or ethnicity for instance. Thus the identity may be local and also on a larger scale, with individuals/ communities remote geographically, yet having something in common. Minorities are hence defined here as a group of people sharing certain features  features that are essential to building the collective identity, as well as a feeling of appurtenance to that specific group, and whose access to power and self-governance is conditioned by another group. 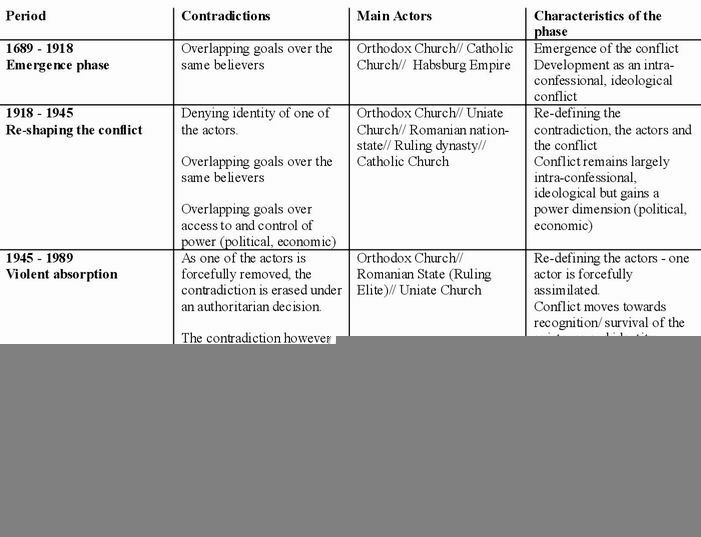 Last, but not least, individuals have multiple identities and appurtenances that cross ethnic, religious and cultural boundaries.22 However, as the complexity of a conflict increases proportionally with the number of the actors involved - thus turning its analysis into an almost impossible task - it becomes necessary that a certain degree of generalization occurs (and this is how Table 1 should be read). If conflict is defined as having a temporal dimension, this implies at least a beginning - the formation of the conflict - and a transformation. What about a solution? A beginning implies an end, a solution - but is that really the case? Can a conflict between two communities have a solution that would not only resolve the contradiction, but also annul the attitudes and the behavior in the long term for all the actors involved, on both collective and individual levels? As the attempt to impose a solution through authoritarian means in phase 3 shows in the current case study, solutions are not final unless - according to Galtung - they are "(1) acceptable to all actors, (2) sustainable by the actors"23 (actors being interpreted here as communities - leaderships and individuals). Table 2 describes the main actors involved in the present phase of the conflict and attempts to map their potential interests (as inferred from their actions). It also takes into consideration the structural constraints, namely the inherent features of the structure (be it local community, state or international system _ in terms of institutional and cultural constraints) that may exert pressure and thus re-shape the conflict. 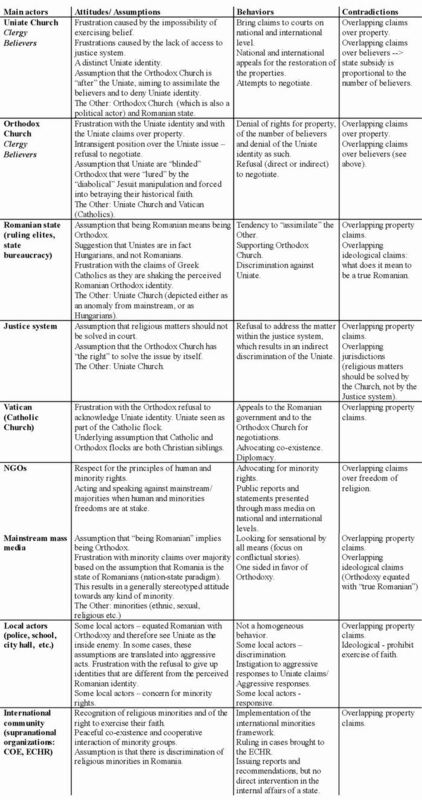 The table however should not be interpreted as a homogenization of actors: within all actors there have been individuals that have expressed different attitudes and behaved differently from their group (for instance, the case of the Metropolitan Bishop of Timisoara, Nicolae Corneanu who, opposing the Orthodox Church's hierarchy, gave back - or at least supported the liturgy by providing worship places - some of the properties to the Uniate Church, among which is the Cathedral in Lugoj). Table 3 makes use of the triadic nature of the conflict (see figure 1 above) to analyze the attitudes, behaviors and the disagreement for each of the main identified actors. While asserting the attitudes/ assumptions and behaviors of others is always a matter of subjectivity, some general patterns can be inferred from the explicit actions of the actors. The analysis in Table 3 is based on subjective inferences from the observation of the actions of the actors involved. It is an interpretation of the main actors and their acts in connection to the conflict. Instead of conclusion: Paths laying ahead. Transcending the ideological level may open new opportunities for a "detensioning" of the Uniate/ Orthodox relations and enforcement of religious minorities rights. But the transformation of the conflict from around one concerning an ideological disagreement to an economic disagreement (overlapping claims over property) does not imply that the ideological rhethorics is not present on the level of attitudes and behavior. However, ideology does not constitute the core of the conflict anymore. So where can the conflict go from here? If conflict is seen as a transformative process, than what are the main factors able to influence its transformation towards a positive outcome? Coming back to figure 1, if conflict is to be seen as the inter-linkage of attitudes/ assumptions, behaviors and contradiction, than pressing upon either one or all of the corners can lead to a reshaping of the conflict. partial) agreement, the situation is prolonged in the hope that it will become the status quo. But this would only deepen the frustrations of the Uniate clergy and believers, which in the long run is neither beneficial, nor productive for any of the actors involved. It may be that attitudes and behavior become more radical, and therefore no agreement can be reached on the contradiction. If the structure remains the same (meaning the legal framework, the behavior of the ruling elites and the refusal of the judiciary to deal with the problem), than it is more likely that the attitudes and behaviors of the two religious communities will be aggravated. Mutual negative feelings will feed hate speech and prejudices, which on their turn will increase the likelihood of a discriminating behavior. However, the pressures from the international organizations and NGOs may induce a positive structural change on the level of Romanian central state apparatus. But change may come through yet another corner: behavior. Should behavior change - either by itself or under external pressures - the content of the disagreement can be approached with various alternative solutions. By finding a common ground for tackling the disagreement, attitudes will be increasingly altered (positively or negatively). If attitudes become more positive, than favourable conditions for a more comprehensive solution for the contradiction could be created. the international organizations (especially under the pressure to incorporate the EHCR decisions, but also under EU integration trends) starts dealing with the overlapping property claims. Such a change must be accompanied by finding a common ground between the two Churches in order to prevent the escalation of negative attitudes on one part or the other. Of course, possible conflict transformations could be looked upon from yet another pespective: community and leadership levels. The influence of actors such as the mass media, NGOs, political elites - on both national and local levels - and local actors could provide the glue for a positive conflict transformation, or could deepen the crisis. Behavior could be addressed on the level of the local communities through a more creative approach, like for instance agreeing to use the same worship facilities for both confessions in places where there is only one church - and intuitively it might seem as easier to find a common ground and to start building in local communities; subsequently, the pressure from the bottom upwards could enforce a change in the behavior of the leadership of the two Churches. Political elites, the justice system and local actors have the power to address the legislative and the judicial aspects - creating favorable conditions for the positive transformation to occur by removing some of the structural constraints causing the imbalance between the two Churches. Table 3: Analysis of the attitudes/ assumptions, behaviors and contradictions as inferred from the explicit actions of the actors. 6 John S. Micgiel, ed. State and Nation Building in East Central Europe: Contemporary Perspectives. New York: Institute on East Central Europe, Columbia University, 1996. 7 Without however assimilating the Uniate as a defining element of Romanian identity. Rather, the legitimation was rather contextual and served the recognition of the Uniate Church as a distinct identity by the Orthodox Church. The Romanian identity is essentially Orthodox, this playing towards the collective forgetting of the role of the Uniate - for instance, the Transylvanian School intelligentsia is not linked to the Uniate identity (enforced "collective amnesia" leads to collective forgetting). 10 Earl E. Pope: "The Contemporary Religious Situation in Romania" in Dennis J. Dunn (ed.) Religion and Communist Society. Berkley: Berkley Slavic Specialties, 1983. 14 Janice Braun, 1998, p. 206. An attempt in 1956 to appeal for the restoration of the Uniate Church was buried under a new wave of persecution. In 1980, a clandestine Uniate committee appealed to the Madrid Conference of the CSCE for the restoration of their church with no success. 15 The Greek Catholics claim from the Romanian state: 2,000 parishes, 1,800 churches, cemeteries, chapels and presbyteries, 11 monasteries, 5 Episcopal residences, 3 theological seminars, 20 schools, 6 hospitals, 4 orphanages, 3 retreat houses. 20 Galtung mentions that in Chinese, crisis has a double meaning of danger and opportunity. 21 Even if some communities may be isolated from the rest of the society (either self-imposed, as a result of a coercive act or due to geographical circumstances), total isolation is impossible to be conceived in today's world. Even if a community might manage to become fully self-sustainable, it will still be caught within the institutional setting of a state and thus forced into at least maintaining some form of relationship with these state structures. Even if this is done only on the level of the ruling elite, spillovers are likely to occur. 22 An individual may be a member of the community X, a mother, a lawyer, with a particular ethnic and religious identity, etc. In cases when communities are defined along ethnic or religious lines, some of the identities might overlap.